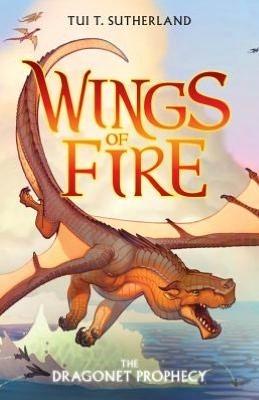 The children at my library are obsessed with the Wings of Fire series. We have whole shelves dedicated to all of those books…which actually makes it easier to show people looking for them where they are. I had always intended to read these books, but after learning that the author would be at Books by the Bank in Cincinnati, I decided it was finally time to read one. Five dragonets (baby dragons) were prophesied to bring back an important dragon treasure and end the reign of the current evil dragon ruler. This ruler was determined to stop the prophecy from ever coming true, so she attempted to kill all of the dragonets that may possibly fulfill it. However, a group of five dragonets were saved and taken away from their families to be raised in a secluded cave. It is there that they were trained by several not-so-nice dragons. The dragonets were desperate to see the world and find something better, so they ran away, which truly set the prophecy in motion. I can see why readers love these books. The stories and characters are simple. They are certainly perfect for younger readers (the readers who are really young but read at a higher level). I don’t necessarily think this book has the meat that I expect of a fantasy for tweens. I think it lacked emotional depth and character development. While this series isn’t something that I plan to finish reading, I can understand why it has taken the juvenile world by storm.